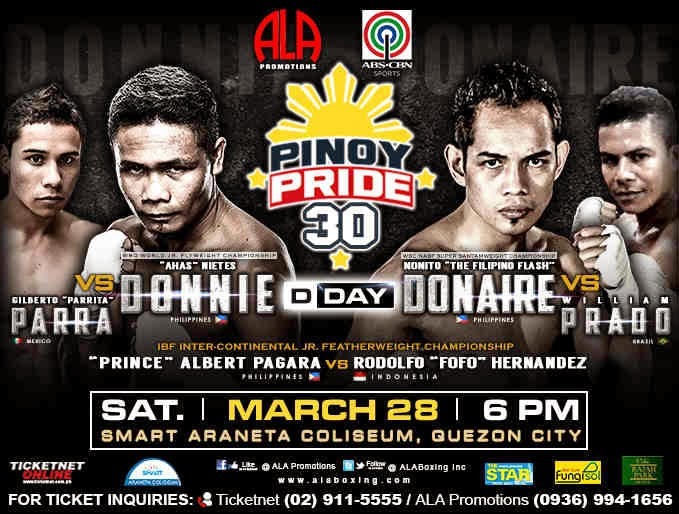 Watch the 30th Pinoy Pride series on March 28, 2015 at Araneta Coliseum, Quezon City, Philippines. This event is brought to you by ABS-CBN Sports and ALA Promotions. Donnie "Ahas" Nietes vs Gilberto "Parrita" Parra of Mexico for the WBO World Jr. Flyweight Title. Aj "Bazooka" Banal vs Junior Bajawa of Indonesia for 8th rounds in featherweight division.